Mark Peterson shows a photo of himself with President Ronald Reagan. There's always a capacity crowd at the Kennett Area Senior Center for the Veterans Luncheon, and the Nov. 6 program was packed with veterans of several wars, as well as their family members. 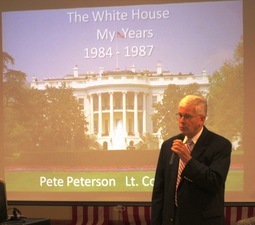 The keynote speaker was Mark “Pete” Peterson, who settled in Chester County in 1962, enlisted in the Marines and served a combat tour in Vietnam. He served in the Marines and was involved in combat missions around the world. He spoke about his three years serving in the White House as the Marine Corps Aide to President Reagan. During his service, Peterson sometimes stayed in the East Wing of the White House, and would perform ceremonial duties with the President, as well as plan trips when the President went abroad. But the main function of the Aides is to carry the nuclear launch codes (“the football” as the code is called) when accompanying the President. The Cold War still lingered during Peterson's time in the White House, and the possibility of a nuclear strike was a constant threat. Peterson recalled that Reagan was a warm, genuine man “who was just the same in person as he was on TV.” He showed many photos of himself with Reagan at ceremonial events and in unguarded moments. “That's the same guy you see here, only he doesn't have white hair,” Peterson joked as he pointed out his younger self.